The plans for the 2017 are tentative as of June 3, 2017. What follows is the draft plan. When: After Masses on June 10-11 and June 17-18. These two weekends are the only time that T-shirts may be ordered in 2017. 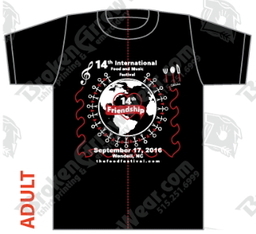 Price: $10 per shirt by cash or check. We are presently exploring having a credit card payment option in 2017. Payment: Payment must accompany the order. Shirt Weight: The shirt weight will be the same weight that was used in 2016; it is a lighter weight than was used in 2015 and earlier years. Standard Colors: 4 colors will be offered for the Pre-Sales. Color options will be illustrated here by June 8. One of these will be a shade of pink. The pink color will not be offered at the General Sales. If you want a pink T-shirt, you have to order during Pre-Sales. Special Colors: You may order any of the available colors from the vendor (see below) provided that you order a minimum of 6 T-shirts. Order Forms: Paper only, with forms available at the T-shirt sales area at the Masses and online here after June 7. No online (e.g., Google Docs) orders will be available in 2017. When: After Masses on July 17-18 and July 24-25 and again in late August/early September. ​Colors: The 2 most popular colors (excluding pink) from the Pre-Sales will be offered at the General Sales. Color options will be illustrated here by July 14. During Pre-Sales you may order any of the colors below provided that you order (and pay for) at least 6 T-shirts. For 2017 magnets are again offered. Magnets are $2 each. They are undated—they will be just as relevant for future festivals as for this year's. Magnet sales will be held at all masses at St. Eugene Catholic Church on weekends during the T-shirt sales. 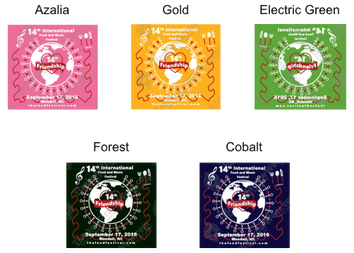 Children in the Religious Education program at St. Eugene Catholic Church submitted twenty-four candidate concepts for the logo for the 2017 International Food and Music Festival. 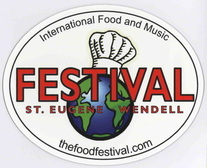 The winning concept was chosen by a vote of the parish members. This year's winner was Hannah Hebert. Thanks to Jared Macias for his realization of the logo concept. 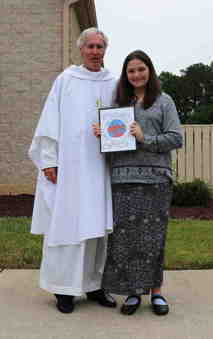 Father Bill congratulating Hannah Hebert on her winning logo concept on May 21. Congratulations to all 9 of the parish youth who participated in the contest.